A few weeks ago another writer recommended I read Erik Larson’s In the Garden of Beasts. The book centers on a Chicago family whose father is sent to Germany as the US Ambassador in the early 1930s, just as the menace of Nazism is emerging. I just started reading the book yesterday. Larson uses historical materials to tell his story. He includes several quotes in the few pages I just finished. What is most intriguing is that he holds your attention. You want to move from page to page to see what will happen next. Larson’s skill as a nonfction writer is that ability to tell a story, based on fact, that reads like a novel. Even though I am not a fan of novels, I find this work engaging and I can’t wait to get back to it. So I guess I do like novels, as long they are nonfiction. I want to write the Pabst Tonic book in a narrative nonfiction style. 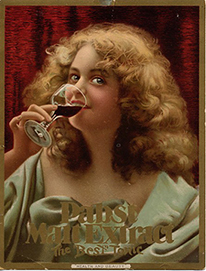 I have collected historical material over the years about the Pabst Tonic, and about A. Cressy Morrison, the advertising manager for Pabst. This Larson book is another step I am taking in the direction of writing the book as narrative nonfiction. I take the journey day by day.